Just in case there was any doubt, EA Maxis wants you all to know that PC gaming isn't dead. Is there any doubt? There was a time, maybe a couple of years ago, when the debate over the future of PC gaming was lively and relevant, but does it really need to be said at this point that the ol' mouse-and-keyboard is alive and well and really rather bored with the whole conversation? The answer is a firm and slightly exasperated "no," but EA Maxis, the studio behind the upcoming SimCity, said it anyway. "We're still seeing the PC market is not dead, it's very much alive," SimCity Lead Producer Kip Katsarelis told GamesIndustry. "Blizzard's shown quite a bit of success with their recent Diablo launch, The Sims is highly successful, so there's a market there, we've got an audience there that wants games on that platform, and we are still a PC house and will continue to be so." Katsarelis said that while the SimCity engine is portable and could run on many different platforms, the PC is "where our market is." The current generation of gamers is aware of the SimCity franchise and has maybe played it on the iPhone, he added, "but they haven't really experienced that true experience on the PC." It's always nice to hear an industry type come out in support of the PC (even if he is from EA) and while I'm certainly not inclined to tell anyone to tone it down, I really don't think it's necessary to keep flogging this particular horse, either. In many ways, the PC is the platform of both innovation and stability; it leads the way in areas like digital distribution and indie game development, but it's not subject to the wild fluctuations of the generational console market. It's great to be loved, but it's also probably safe at this point to stop worrying quite so much. 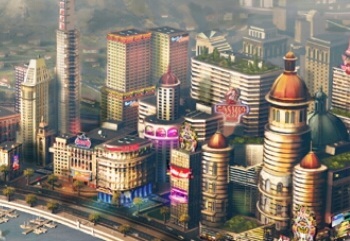 The new SimCity, by the way, is scheduled to come out in February 2013 for the PC and Mac.